"Senior national security leaders have stated that the U.S. needs to work off the assumption that North Korea will have ICBM capabilities soon, and in this business ‘soon' could mean five to 10 years, or earlier," Cohen said. "This question is, do we need to wait until North Korea successfully launches a test ICBM to know that they have that capacity? The answer is no … The [Aegis Ashore] is a proven system. Why would we protect our European allies before we protect the homeland?" Converting the Aegis Ashore site from an experimental facility to a combat-ready platform would cost an estimated $41 million, which Cohen described as "inexpensive" compared to typical Defense Department expenditures. The proposal to improve Hawaii's missile defense capabilities gained support among defense officials on Monday after North Korea launched four missiles that coincided with joint U.S.-South Korean military exercises in the region. The U.S. joint chiefs initially believed that at least one of the projectiles launched by North Korea was an intercontinental ballistic missile capable of striking America's West Coast, but ultimately concluded the projectiles did not have the range of an ICBM. Defense officials have warned that North Korea is on the brink of producing an ICBM that could target the United States. 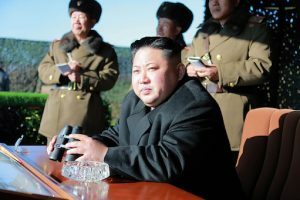 North Korean leader Kim Jong Un announced in January during his New Year's address that Pyongyang had "entered the final stage of preparations to test-launch" an ICBM that could reach parts of the United States. President Donald Trump rejected Kim's assessment, tweeting after the statement: "It won't happen!" The administration has not yet established a missile defense plan that would protect the United States from a North Korean ICBM, though it is in the process of reviewing U.S. policy toward North Korea. "Our intelligence has been surprised again and again by technology developments by adversaries or attacks the U.S. didn't foresee," Cohen said. "Hawaii has a particularly symbolic history of this given the attacks on Pearl Harbor. Let's not be surprised this time, let's be prepared."